← Things I’m excited about: A spring style challenge! Last week I said ‘yes’ to all of the things. I realize that I don’t write very often about what I actually spend my time doing day in and day out. Once upon a time bloggers wrote a lot of recaps, but I think those are all but disappearing in favor of more Pinterest-worthy posts. So, readers of this blog probably don’t know what I spend my time doing when I’m not roaming the internet. I’m about to remedy that situation. Here’s a completely out of order and scattered recap of last week. Evidently wine turns me into an artist! Also, next time I go out with Ashley I’m wearing 8 inch heels. + I went to boxing class a few times. + I babysat two other kiddos one afternoon. It turns out watching four kids under four years old is chaos and I can’t handle it for longer than a few hours. I think I need to build up my stamina. + Clara and I went to a playdate with MOPS friends. + I took Clara to her gym class. + I rocked babies to sleep and read books over and over and made lunches and snacks and breakfasts and dinners and even remembered to feed myself occasionally. 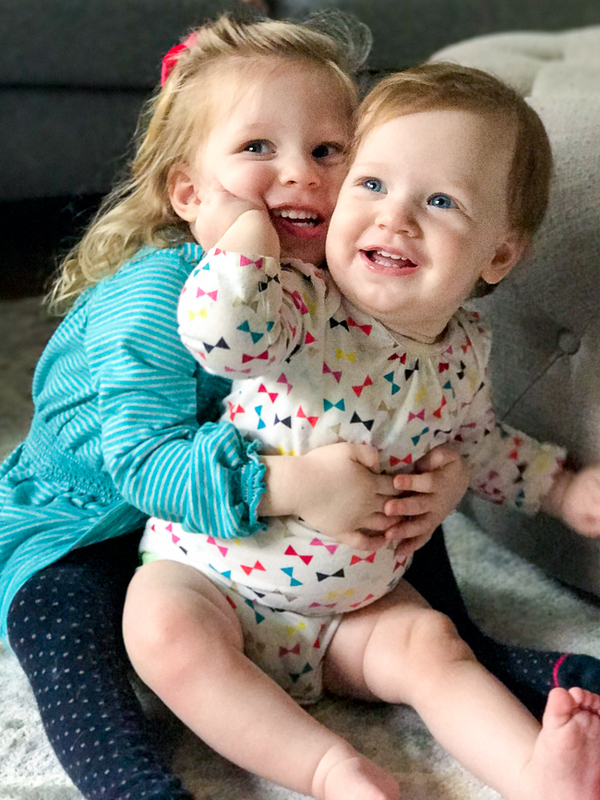 + We had one day with back-to-back playdates…. all before naptime! It was wonderful and I absolutely love connecting to and catching up with other moms. + I talked to a best friend on the phone. + I watched March Madness. A lot of March Madness. 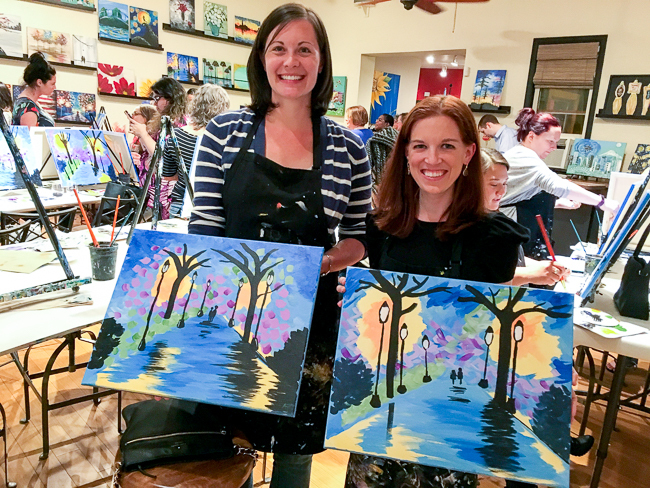 + I went to a painting and wine night at Canvas! in Fremont. I don’t even have one artistic bone in my body but give me wine and I’ll happily paint the night away. + I finally finished this book (highly recommended!). + Tim was sick one day so I was on ‘mom duty’ allllll morning/day/night. + Tim also had a busy week at work so he left before 7am each day and came back at dinner time. I know that’s some people’s normal schedule, but it was a few very long days for me. Grainy but ADORABLE. Not that I’m completely biased. Also, right after this pic was taken Clara full on tackled Isabelle. Sisters. + I bought three pairs of shoes from ThredUp. I haven’t bought shoes in forever so I’m very excited! They’re all for the spring style challenge I mentioned yesterday. + I volunteered at a tax site for five hours (preparing taxes for low income clients). + I made a lot of lattes, cleaned the floor countless times, did some errands and shopping and tidying, cooked meals and baked cookies, dropped off/picked up Clara from preschool, and MOST IMPORTANTLY kept everyone alive. And if you know me, you know that I love being busy. Like, I had the best week! But at the end of the day I was pretty worn out. So this week I’m been doing it a bit differently. The girls and I don’t have many plans (quite the opposite of last week!) so I’m staying in. Once the girls go to bed I’m reading and writing and journaling and relaxing with my feet up. Last night I skipped volunteering and tonight I skipped working out at the boxing gym. It’s not that those things aren’t important to me – they are! – but I’m trying to pay attention to how I’m feeling and what my body and mind want to do, and they want to rest! This week is about watching reality TV and listening to podcasts and running around less so I can breathe a bit more. It’s about balance. Is your week busy or have you been able to put your feet up? This entry was posted in week recap and tagged week recap. Bookmark the permalink. 5 Responses to Last week I said ‘yes’ to all of the things. I love how your painting turned out! And I love that you volunteered to do taxes, that’s so cool! The long mom days without your partner to relieve you/help you out at some point are rough, especially when said partner is sick so you’re basically taking care of them in addition to your kids! Good for you for volunteering to help others with their taxes! 4 kids under 4 sounds insane. Ha. I miss the days when most bloggers would write more personal posts (not necessarily “Let me tell you about my deep dark secret” posts but just, “This is what I did with my day/week” sort of posts). I always found those was more interesting than posts that completely remove the human element from them in favor of SEO, hits, clicks, etc. Obviously that stuff is important if you’re generating income through your blog, but I found it much easier to get invested in a blogger if they talked about them and what was going on in their life rather than other things! Your painting is so pretty! I’ve done a few of those painting classes over the years and I’m always so surprised how much better my paintings turned out than I would’ve expected. Yay for full weeks! But also yay for netflix-watching, recovering kind of weeks. If you can get your kids to nap…haha. May the odds be in your favor!